Can liquidity rise or stay high when global monetary base contracts? David Rosenberg‏ @EconguyRosie Nov 21 – The clowns on TV rant about the great macro backdrop and alluring valuations. No mention of liquidity as if they don’t know this is the fuel for risk assets. Someone should tell them that the global monetary base began to contract last March and is now running at a -7% YoY rate. Raoul Pal‏Verified account @RaoulGMI – Don’t forget… Part 2 The biggest short vol position in the history of markets (all assets) The biggest long position in the history of oil markets The near biggest long position in the history of copper The largest short position in the dollar ever recorded. After the past couple of weeks & a crash of 20%+, the biggest long position in history in oil is now history. What about the near biggest long position in Copper’s history? Given the carnage in base metal stocks, that is probably history too. What about the largest long position in history of equities? 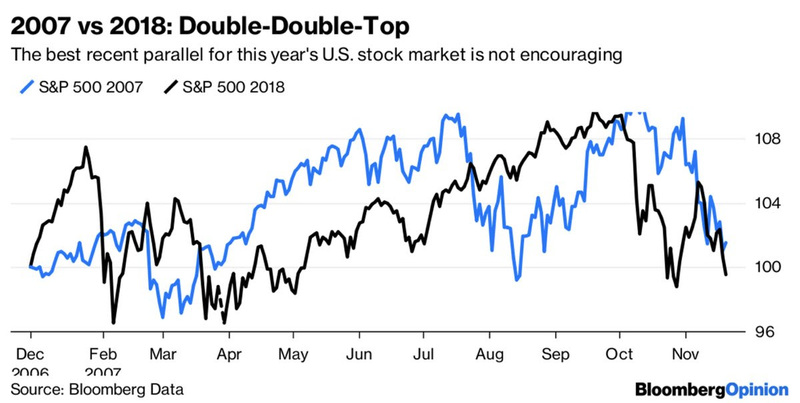 Yes, the S&P has been battered and is now down nearly 10% from its high. This week was particularly bad with a near 4% decline in Dow and S&P with 5% decline in NDX. But the VIX is only at 21.47 as of Friday. What is even more weird is that the Treasury curve is virtually unchanged this week despite the broad stock indices down 4%-5% and VIX up 18%. The 30-year yield was flat this week, the 10-year yield down only 2 bps, the 5-year yield flat & the 2-year yield actually up 1 bps. What did Gundlach say about that? And note this refusal of Treasury yields to decline is despite the German 30-yr yield falling 4 bps this week & the German 10-year yield falling 2 bps. Is that due to what is going on in the economy? Not if you believe David Rosenberg! David Rosenberg‏@EconguyRosieThe credit contraction is starting and recession follows. See “Rates Roil Small Mortgage Firms” on the front page of the WSJ. The # of U.S. nonbank mortgage lenders has shrunk 3.5% from a year ago; over half of the $1.26 tln of mtg originationscame from this group this year. Perhaps, the leading growth index is still rising giving hope. But, wasn’t that down -3% last week, a 140-week low? Perhaps it rose this week. Dream on! So it is not the US economy and it is certainly not the non-US economy. So what is keeping VIX so low & the interest rates so resiliently above key levels like 3% on 10-year? 2. DSI or Faith in the Great Communicator? Such single digit levels in the Daily Sentiment Index for S&P and Nasdaq have usually produced rallies. And the fabled year-end rally is only a month away. May be that is why the VIX refused to get swayed by the 4%-5% declines in stocks indices this week. And if the stocks could potentially rally, why would Treasury yields break support? And then you have the confidence in the Great Communicator Chairman Powell who speaks with honest clarity. And he has given no indication that he is even thinking about pausing let alone stopping. Charlie Bilello‏Verified account@charliebilelloNov 21 – In years past, a correction of this magnitude would have immediately pushed back rate hike expectations. Did not happen in Jan-Feb correction & not happening here. 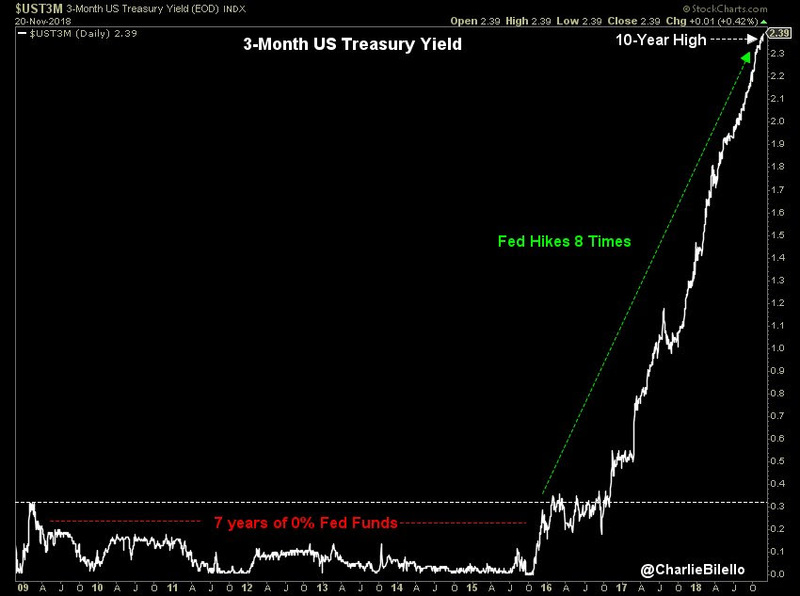 Market still expecting another hike in Dec (>75% odds) w/ 3-month Treasury yield @ its highest level since Jan 2008. But before the December FOMC meeting, we will get the Nonfarm payroll report & ISM numbers. If these remain strong and especially if we get a strong employment report with wages going up & unemployment down some more, then can the Fed not raise rates or even raise rates dovishly? What a title to a report that recommends buying Treasury bonds across maturities, 2-year and 10-year. Raoul Pal calls it his highest conviction trade. The reasoning is simple – inflation dead, growth potentially slowing and the market heavily underweight Treasury bonds. How can Treasuries refuse to rally big? The big question is when? A big rally in Treasuries will close out the last extreme positioning mentioned by Raoul Pal in April 2018 – the largest short position in Treasuries in history. Unlike the above absolute recommendation, J.C.Parets said if the 10-year yield breaks 3% to the downside, then we could see a face-ripping rally in Treasuries. What about credit? Peter Tchir of Academy Securities said “this is not going to be a big downtrade in credit“. 4. Bear Market with or without a big rally? That would make it before the FOMC meeting on December 13. Jeff York, PPT‏ @Pivotal_Pivots Will the 400d hold again on the $SPY $SPX? 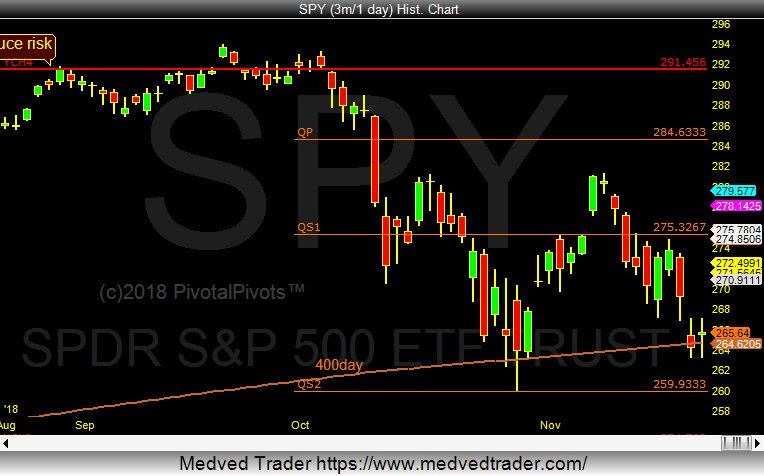 So far, the 400day moving average & the Qs2 pivot point, has been strong support @PivotalPivots. 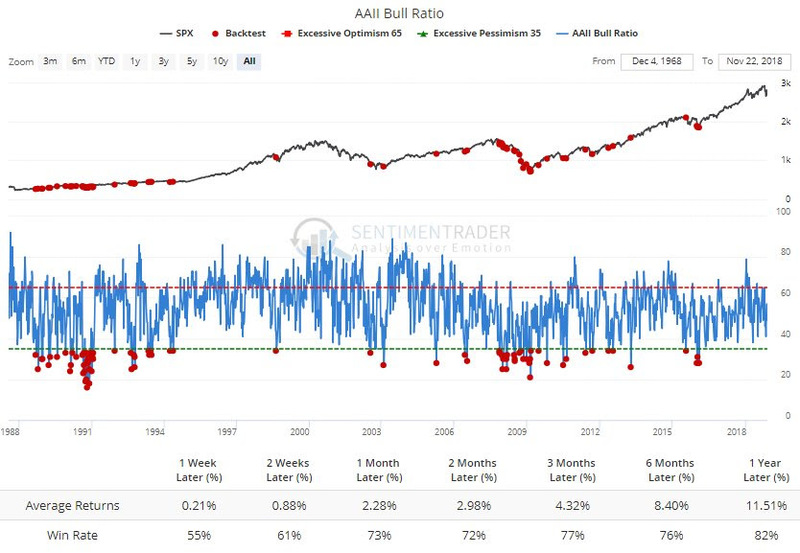 SentimenTrader‏Verified account @sentimentrader Nov 22 – AAII Bull Ratio below 35% this week. According to our Backtest Engine, average 1-year forward return was 11.5% and positive 82% of the time. Excluding just 2008, that climbs to 18.2% with 94% win rate. 6-month was 12.7% average with 88% win rate. But what if you don’t exclude 2007-2008?